Anna Cisecki, Executive Director of Australian Diamond Portfolio, was asked to contribute to Equity magazine, a monthly publication issued by Australian Shareholders’ Association (ASA), the peak body representing independent investors in Australia. With growing interest in pink diamonds, the article below outlines the main reasons to invest in pink diamonds, an overview of performance, as well as some tips on investing. Over the last 15 years, demand for investment grade pink diamonds has soared, with investors all over the world, including in Australia, seeking to purchase these truly unique assets. Australian Diamond Portfolio (ADP) has had a front row seat facilitating the growth in this sector locally, and has helped thousands of Australians source, store and trade pink diamonds. In this article, we look at some of the benefits, & logistics, of investing in this asset class. There are many benefits that pink diamonds bring to a well-diversified investment portfolio. For Australian investors with a SMSF, we see three key reasons why these precious stones should be on the radar. Over the past decade and more, anyone that has purchased a pink diamond has seen a significant appreciation in value on their investment. 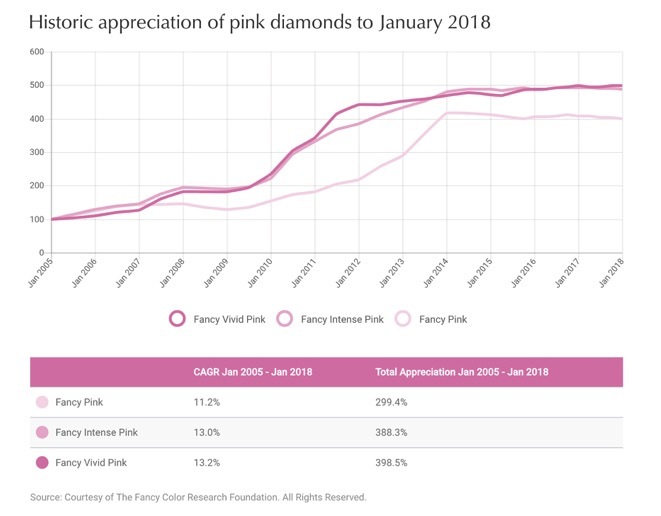 This is captured in the chart below, which highlights the growth in prices across several categories of investment grade pink diamonds since 2005. All categories have appreciated in a similar manner over the period, averaging between 12-20% per annum. Whilst international equities and other more traditional asset classes have appreciated strongly in the past few years, the returns from pink diamonds since 2005 exceed most listed assets. We expect the strong capital gains to continue in the years ahead, as a wave of new demand is likely to coincide with a spectacular decline in supply. On the supply front, it is important to note that almost 95% of annual natural pink diamond supply is mined right here in Australia, at Rio Tinto’s world-famous Argyle Mine. In operation since the early 1980s, the mine is scheduled to completely cease production by 2020, as supply has been exhausted. This pending closure of the world’s primary source of pink diamonds is a major bullish factor for the investment diamond market. On the demand side, whilst equities have had a great run since early 2009, valuations are now increasingly stretched (especially in the United States), whilst bond yields are still hovering near multi-generational lows. With inflation starting to stir, and cash accounts in most of the developed world still paying close to zero in real terms, every day more and more investors are turning to alternative hard assets, including diamonds, as returns in more traditional assets are likely to be limited in the years ahead. Given the supply constraints discussed above, higher demand can only be met through higher prices. Pink diamonds have shown very good stability and consistency of performance over the long-term. Unlike more volatile assets such as shares, they do not suffer the violent ups and downs that can understandably rattle investors. This can also be seen in the previous chart, which highlights the fact that there has been almost no downward movement in the 13 or so years of market data the chart covers, including the period that encompassed the worst of the GFC. Instead, pink diamonds offer many years of relatively modest gains, interspersed with years where investment demand and prices soared. These are valuable attributes in any investment. As diamonds are priced in US Dollars, they will benefit from any fall in the Australian dollar, which will increase the price of the diamonds domestically. Given many economists expect the AUD to fall in the coming years, currency diversification, is becoming increasingly important to SMSF trustees. Diamonds offer a relatively straightforward, and unique way of achieving this currency diversification, whilst simultaneously giving the investor exposure to an uncorrelated hard asset. Adding all this together, whilst diamonds are a non-income producing asset, and are definitely not best suited for short-term traders, they can play a role in a portfolio, as the potential for capital appreciation, the protection from market volatility, and the Australian dollar hedge combine to provide important diversification benefits for Australian investors. Whilst many might imagine that investment grade pink diamonds are the preserve of ultra-high net worth individuals, the market is actually very accessible to a far wider pool of investors, including SMSF trustees. At a minimum, investors would need to commit to AUD $20,000 per stone, though in our experience, most investors accessing this space tend to start with an investment closer to AUD $50,000, and often work their way up to portfolios of AUD $100,000 or more. Given the average SMSF is these days holding close to $1 million in assets, portfolio allocations tend to be in the 5-15% range. We encourage clients to see investment diamonds as a minimum 3-5 year investment, as this timeframe will give them the best chance of partaking in the upside the market has to offer. Selling diamonds is also very straightforward, and typically takes 3 months at a maximum, about the same time it takes to sell real estate. ADP’s brokerage service upon completed sale totals 5%. Finally, from a compliance and reporting perspective, diamonds owned inside a SMSF are required to be ‘securely stored’, and insurance and regular valuations are . Companies like ADP provide a solution covering all these requirements, including independent valuations on an annual basis, fixed-rate storage for $272 pa as well as facilitation of insurance through our vaulting partners for an approximate fee of just 0.20%-0.36% p.a. of the diamond portfolio value.